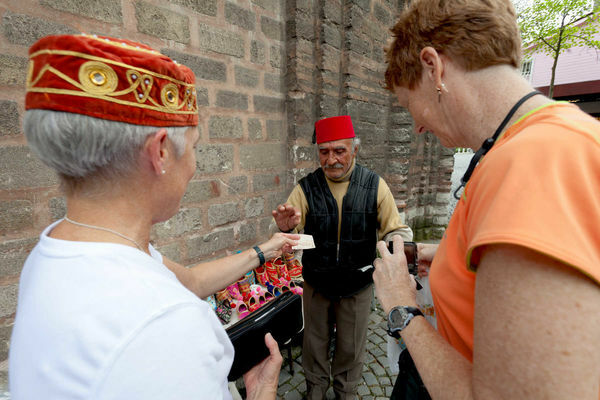 Practicing your haggling with a merchant is a sure way to feel like a temporary local. After mastering a few bargaining basics, any traveler can shop with confidence in Europe's open-air markets. Determine if bargaining is appropriate. It's bad shopping etiquette to "make an offer" for a tweed hat in a London department store. It's foolish not to at a Greek flea market. To learn if a price is fixed, show some interest in an item but say, "It's just too much money." You've put the merchant in a position to make the first offer. If he comes down even 2 percent, there's nothing sacred about the price tag. Haggle away. Shop around to find out what locals pay. Prices can vary drastically among vendors at the same flea market, and even at the same stall. If prices aren't marked, assume there's a double price standard: one for locals and one for you. If only tourists buy the item you're pricing, watch to see what a tourist from elsewhere in Europe would be charged. I remember thinking I did well in Istanbul's Grand Bazaar, until I learned my Spanish friend bought the same shirt for 30 percent less. 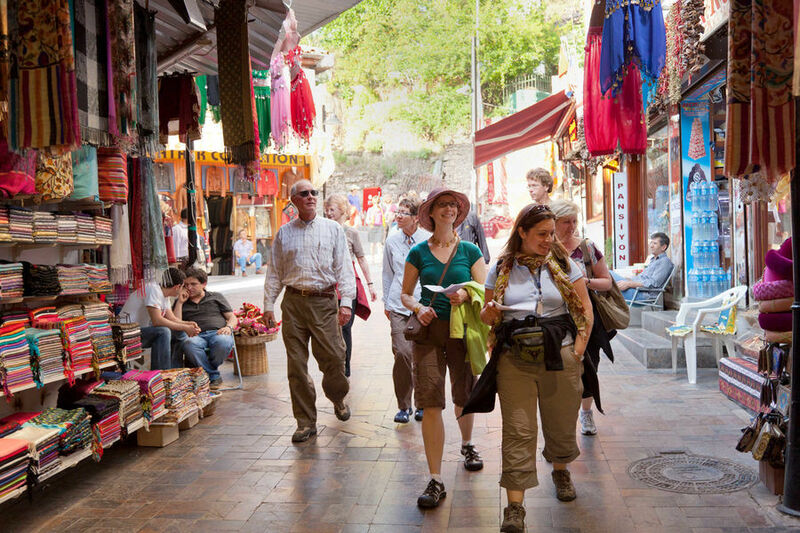 Merchants assume American tourists are rich, and they know what we pay for things at home. Determine what the item is worth to you. Marked prices can distort your idea of an item's true worth. The merchant is playing a psychological game. Many tourists think that if they can cut the price by 50 percent they are doing great. So the merchant quadruples his prices and the tourist happily pays double the fair value. The best way to deal with crazy price tags is to ignore them. Before you even find out the price, determine the item's value to you, considering the hassles involved in packing it or shipping it home. Determine the merchant's lowest price. Merchants hate to lose a sale. Work the cost down, but if it doesn't match with the price you have in mind, walk away. That last amount the merchant hollers out as you turn the corner is often the best price you'll get. If that price is right, go back and buy. Prices often drop at the end of the day, when merchants are about to pack up. Curb your enthusiasm. As soon as the merchant perceives the "I gotta have that!" in you, you'll never get the best price. He assumes Americans have the money to buy what they really want. Keep a poker face and don't settle for the first counter-offer. Employ a third person. Use your friend who is worried about the ever-dwindling budget or who doesn't like the price or who is bored and wants to return to the hotel. This trick can work to bring the price down faster. Impress the merchant with your knowledge. You'll earn some respect — and be more likely to get good quality. Istanbul has very good leather coats for a fraction of the US cost. Before my trip I talked to some leather-coat sellers and was much better prepared to confidently pick out a good coat in Istanbul. Ask for a deal on multiple items. See if the merchant will give you a better price if you buy in bulk (three necklaces instead of one). The more they think they can sell, the more flexible they may become. Offer to pay cash at stalls that take credit cards. You can expect to pay cash for most things at street markets, but some merchants who sell pricier goods (nice jewelry, artwork, etc.) take credit cards, too. They're often more willing to strike a deal if you pay cash, since they don't lose any profit to credit-card fees. Show the merchant your money. Physically hold out what you are willing to spend and offer "all you have" to pay for whatever you're bickering over. The salesperson might be tempted to just grab your money and say, "Oh, OK."
Obey the rules. Don't hurry. Bargaining is rarely rushed. Make sure you are dealing with someone who has the authority to bend a price downward. Bid respectfully. If a merchant accepts your price (or vice versa), you must buy the item. If the price is too much, leave. Never worry about having taken too much of the merchant's time. Merchants are experienced businesspeople who know they won't close every deal. Mapping apps Locate nearby ATMs and banks (and restaurants, pharmacies, etc.) with Google Maps, Apple Maps, CityMaps2Go, etc.